Entering South Island with North Island in the background. We left Wellington on Thursday morning taking a taxi to the ferry terminal to catch the 09.00 ferry across the Cook Straight to the South Island. We were leaving the buzz of the capital city for the costal wilderness of the Marlborough Sound, an area of bays and inlets, islands and headlands, mountains and forest. After two days of winds gusting 40-50 mph and facing a three-and-a-half-hour journey across one of the most unpredictable stretches of water in the world I can’t tell you how much we were hoping that the forecast of calm weather would come good. Sure enough Thursday morning dawned calm and sunny, we put on our trusty wristbands just to be on the safe side and boarded the Interislander Ferry. With their usual attention to detail our travel agents had booked us in to the Premium Plus Lounge; café style seating, complimentary food and drink and nobody under 18. We found some seats by the window and while waiting for the ferry to set off (i.e. before there was any chance of it starting to rock) we took advantage of the breakfast buffet. 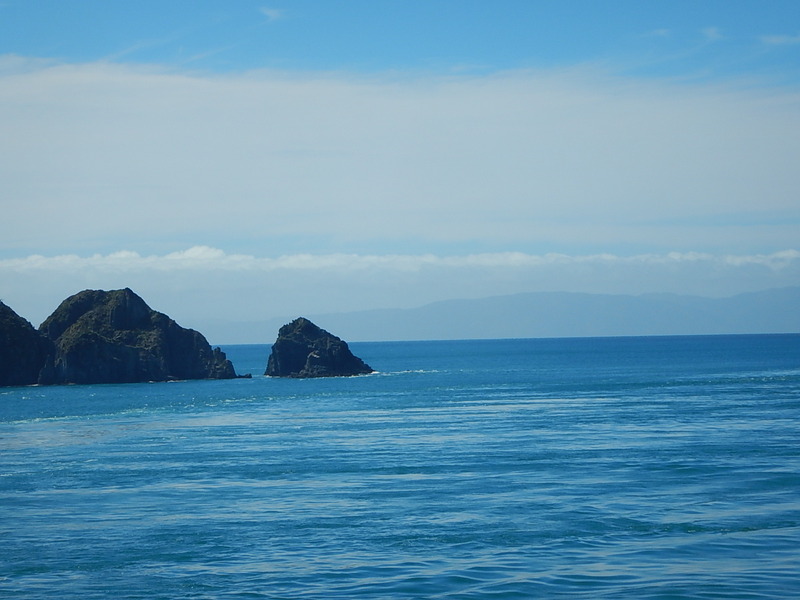 We left bang on schedule and the first hour of the journey was across Wellington Harbour and out into the Cook Straight, it was a very pleasant journey with lots to see. Crossing the straight was surprisingly quick and luckily it was very calm, almost straight away we could see the coast of the South Island ahead of us. Mid way the Premium Plus Lounge crew cleared away breakfast and announced Morning Tea(! ), for the rest of the journey we could help ourselves to scones with cream and jam, a selection of mini quiches, chocolate brownies and eclairs and sushi. Tea, coffee, cold drinks, wine and beer were available on demand. All very tempting, however our attention was completely distracted by the stunning scenery outside the windows. As we left the Cook Straight we entered the Marlborough Sound a breathtakingly beautiful landscape of wooded mountains, sheltered coves and islands. The ferry picked its way through the channels sometimes coming no more than 10 meters from rock outcrops. We spent over an hour cruising the crystal clear bright turquoise water heading for the terminal at Picton. Once the ferry had docked we collected our luggage and walked around the seafront path to the Cougar Line Water Taxi office, we were booked on a boat to take us back through the Sound to Ferneaux Lodge Hotel on the Endeavour Inlet. Furneaux Lodge is one of a series of campsites and lodges serving the Queen Charlotte Walking Track, a 75km track which can’t be reached by road. We were booked in to Furneaux for three days but a lot of their guests stop of for one night while walking the track with their bags being carried ahead for them by the taxi. The water taxis provide a lifeline for the isolated holiday homes and waterside communities along Queen Charlotte Sound; as well as transporting us and half a dozen other tourists staying around the Sound our taxi stopped along the way to drop off a large fridge freezer, a slot machine, a lot of building materials, 4 large bags of potting compost and a father and son mountain biking team setting of on a long distance ride. Much like the trip from Matamanoa Island our transfer to the hotel was an adventure in itself. We were the only people alighting at Furneaux Lodge, a quad bike met the ferry at the jetty and whisked away our suitcases while we walked through the garden to reception; we were expected, we didn’t have to check in or even give our names, we were just shown to our first floor suite over-looking the lake and invited to return to reception if we wanted to discuss any plans for our stay. We headed down to the bar for a drink and met Jess, a backpacker from Bridport who had signed up for a summer as bar maid/waitress at Furneaux Lodge to earn some money so she could carry on travelling. She was great fun and told us that she had room and board provided and as it was 90 minutes by boat to the nearest shop she was hoping to put aside some savings. The weather forecast for Friday was heavy rain with sunshine promised on Saturday; our initial plan was to chill out for a day at the Lodge while the weather cleared and then walk a section of the track on Saturday. Friday night was very windy and it poured with rain, in the morning it was quite cold and grey but the rain appeared to have passed and we thought about revising our plans. We struggled to find out any information about the walking track, we were given a map that looked much like the maps you get for crazy golf courses, no information about the type of walk or the level of challenge it might offer, we were quite cautious because once you set off you are on your own, there are no roads or bus stops, no phones (or phone signals) and one afternoon taxi which picks up at a couple of places but doesn’t wait for anybody. We talked to Jess and to two women in reception, they suggested we catch the water taxi to Punga Cove and walk back to the hotel, this was 12.7km and would take 3-4 hours and was, we were assured, virtually flat. We decided this would give us a chance to calibrate the level of difficulty and decide if we wanted to do the longer walk in the other direction to Ship Cove on Saturday. We hopped on the 11.30 taxi from the jetty for the 10-minute crossing to Punga Cove, from there we struck out along the track. It was a four hour walk but it wasn’t flat!! We followed the track up and over headlands and around the head of two inlets occasionally dropping down almost to water level before climbing again into the rain forest (it is actually temperate rain forest) until we could cross wooden bridges over streams and water falls. As we crossed one stream I picked up the distinct aroma of goat’s cheese, I looked around hoping to see a bijoux café/bistro serving coffee and tasty morsels, no such luck, around the corner we disturbed two wild goats that quickly disappeared in to the undergrowth, at least my nose hadn’t deceived me! The scenery was fantastic and we saw maybe a dozen other people along the whole route, all of them going the other way. We were pretty tired when we got back and we took Jess to task over her promise that it was an easy walk and mostly level, her response was ‘if I’d told you wat it was really like you wouldn’t have done it’. We were in two minds whether to do the longer and apparently more difficult walk from Ship Cove to Furneaux Lodge the next day, it was presented as a 4-5 hour walk but we figured we could set of in the morning and just take our time getting back to the hotel. On further investigation however we discovered that water taxi runs from Ship Cove to Furneaux Lodge and picks up at 14.15, the thought of doing that walk with a hard deadline put us off the idea, and the thought of setting out and missing the taxi made up our minds. We spent a sunny Saturday at the Lodge watching walkers come and go and yachts arrive in the inlet and come ashore for lunch. We explored the gardens, walked along the waterfront sat in the sunshine and read our books. A lovely relaxing day. Love the blog, NZ sounds amazing.